The Summit Road Residence capitalizes on wide views of the San Francisco Bay. 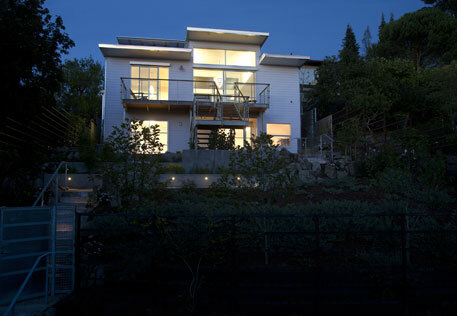 Located in the North Berkeley Hills, this new building replaces an existing house on the site. Multiple levels of living space take advantage of the steeply sloped site. With floor to ceiling windows and sunny decks, the Residence provides many spaces for enjoying sunlight. An inner entry courtyard forges a strong link between indoor and outdoor space.